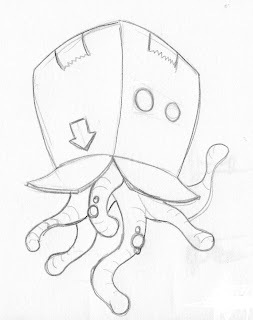 Here is a little sketch I did of the CreatureBox Logo. They do some really awesome stuff and create some really inspiring creatures. Hopefully I will get to inking and coloring this. Cool David, I like this one. I am wondering what colors you are going to use, be sure to post it if you add color! Are you doing this for a website or something and is it a side job or something? Thanks. No Im just doing it for fun I wish I was getting payed that would be sweet.